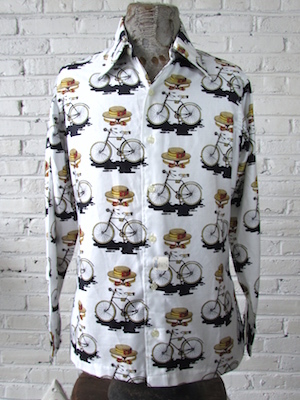 Home > Men's Vintage Shirts > All Men's Vintage Shirts > (XS) Vintage Mens 70s Disco Shirt! Ghost Biker! Disembodied Hat Floating Above a Bicycle! Mens vintage 1970s disco shirt. The ghost of bikers past? 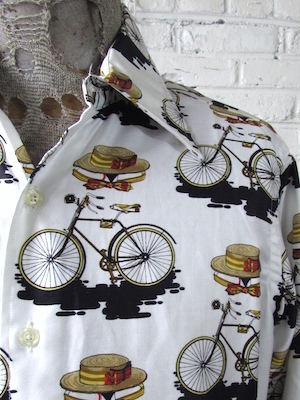 This spooky yet whimsical disco shirt has a white base with a print of a bicycle with a disembodied old fashioned boater hat, collar and bowtie floating above it. Has a super wide & pointy disco era collar. Closes in the front with pearly white buttons with two matching buttons on each cuff. Shirt has a straight hem. Tagged by Rags. 100% Cotton. .